TAOS Gifts have just got stock of a new yummy chocolate range from Hider Foods, and we are seriously impressed about the quality and taste. Other flavours in the range include Raspberry and Yogurt Clusters covered in white chocolate, Jumbo Raisins covered in white and milk chocolate and Salted Pretzels covered in milk chocolate. They are all priced at £2.50 a bag except the pretzels which are only £1.50 each. Treat yourself, you deserve it! 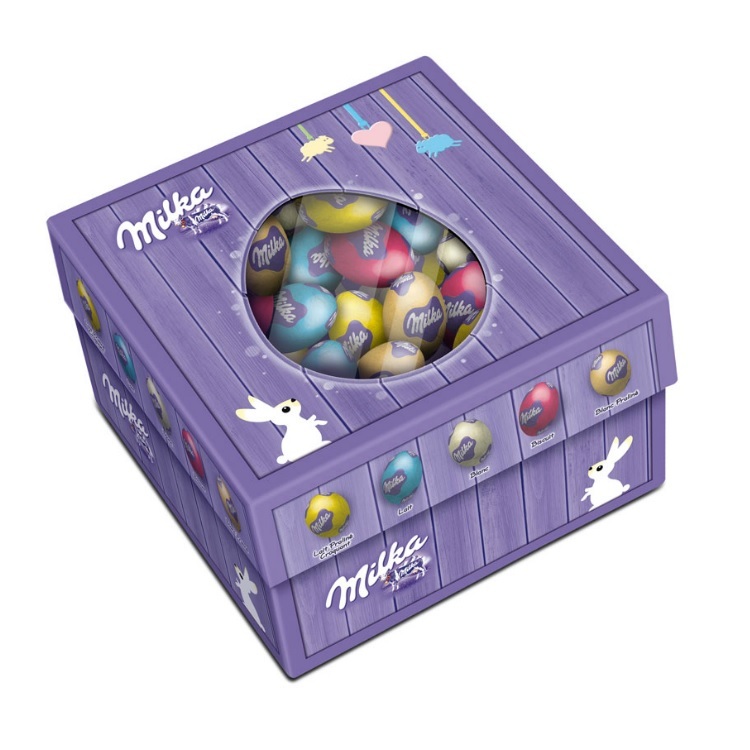 This year we are stocking lots of yummy Milka chocolate mini eggs for Easter. There is a 400g assorted Gift Box available as well as three varieties of small 100g bags of Dime, Biscuit and Milk chocolate mini eggs. The assorted Gift Box contains an assortment of approximately 50 milk praline, milk, white, milk biscuit and white praline chocolate mini eggs. A really great assortment of eggs to suit all tastes, ideal for adults or children this Easter. What’s your favourite mini eggs in this box? We love the traditional creamy Milk chocolate mini eggs but to be honest there are not any in the box that we don’t like!! The small 100g bags of Dime, Biscuit and Milk contain approximately 12 eggs each, all eggs are 3cm in size making them ideal for children. The mini egge are also ideal for all round little sweet treats (whilst stocks last of course), but you may find it hard not to eat them all in one sitting…. Brightly coloured adjustable Hula Hoop for children of all ages, suitable for adults too, well we can’t let the children have all the fun. The Hula Hoop is made from eight slot together sections, you can use six, seven or eight sections to make three different sizes of Hula Hoop from 57cm to 75cm in diameter. Ideal for a growing child. Each section of the Hula Hoop is brightly coloured and simply slides into another piece to create an unbroken plastic loop and it comes in a smart gift box. Go outside and play! The V&A archives hold millions of amazing artifacts, including world class collections of glass, textiles, graphics, photography and fashion, offering a wealth of inspiration to designers and manufacturers. The V&A Collection by Shearer Candles introduces a set of 4 scented candles and reed diffusers taking inspiration from one of the most innovative Arts and Crafts designers, Charles Annesley Voysey (1857 – 1941). Voysey was an English architect, furniture and textile designer famed for his highly original style. This range draws upon a design for a wallpaper by C.F.A Voyset, England about 1900. © Victoria and Albert Museum. In the range there is a 60 hour Scented Candle in a decorative glass jar, and a 200ml Reed Diffuser, both beautifully presented in a stylish gift box that is sure to impress your recipient. The Reed Diffuser also comes as a handy Refill Set complete with a 200ml bottle of fragranced oil and a set of replacement reeds, so you need not despair when it has run out. We have not forgotten about those looking to reduce their sugar intake this Easter at TAOS Gifts, and this year we have a range of Stevia No Added Sugar Easter chocolate by Cavalier that is kinder to teeth and does not have any side effect (unlike some traditional no added sugar chocolate sweetened with maltitol). Stevia No Added Sugar chocolate is suitable for diabetics as part of a controlled diet, and a tasty chocolate alternative to the boring dark chocolate they are normally advised to eat. Remember to be treat wise though! The Stevia No Added Sugar chocolate Easter eggs by Cavalier are available in a twin pack of small hollow eggs, and also as small individual mini eggs. We also have some Celtic No Added Sugar chocolate Easter eggs also available that are also gluten free as well as sugar free. Create cracking effects with Toma Krackle Nail Polish by Mad Beauty. It’s simple to use, apply one or two coats of the Krackle coloured base coat, a thin Krackle coat and then seal with a Krackle sealing top coat for beautiful painted nails instantly. Available in 14 different top crackle colours, and 3 pretty base coats white, glorious gold and stunning silver. For best results and to stop the cracking, apply the specially formulated Krackle sealer top coat which protects the crackle glaze and finishes the nails with a high shine. Use different coloured crackle polish on each nail for dramatic effects or paint only across the tip of the nail for a pretty coloured French manicure finish. With such a beautiful rainbow of colours available the only limit is your imagination! With beautiful shattering, crackling effects its nail art in a bottle! Prepare your nails with style this party season, there are enough colours to mix and match to complement your outfit perfectly. You’ll have the best dressed nails at the party! Toma Krackle was the original shattering nail polish in the UK, you can find the full range of colours as well as lots more Mad Beauty products at TAOS Gifts. We are currently offering a special discount on Toma Krackle polish, purchase a Krackle base coat in your chosen colour, any coloured Krackle glaze and a specially formulated Krackle top coat for a special price of £14.95 (saving £2.90) for all three!